Coelogyne cristata is an epiphytic orchid that comes from cool, moist areas of the eastern Himalayas and Vietnam. It blooms every spring, before the snow begins to melt. 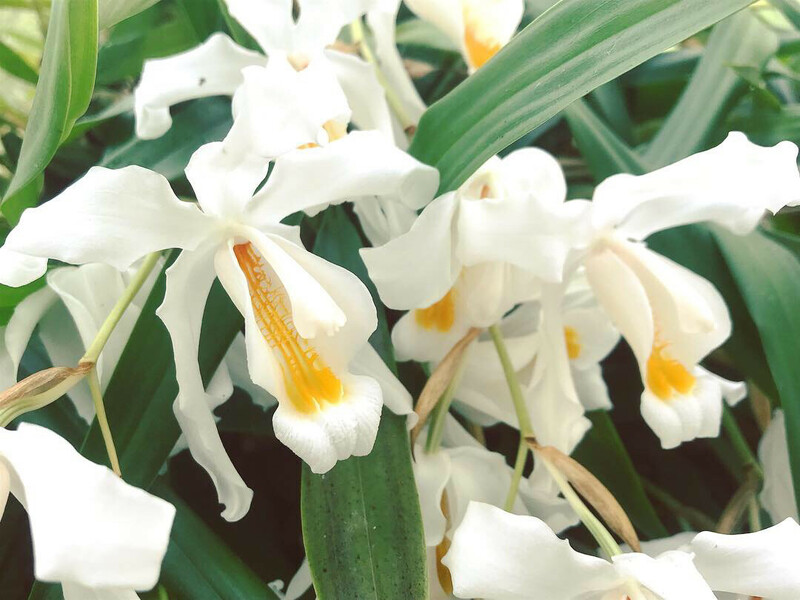 Its genus name Coelogyne originates from two Greek words, koilos (“hollow”) and gyne (“woman”), because of the orchid’s pistil. Cristata takes its species name from crista, the Latin word for “comb”, because of the look of the flower’s lip. In pots, the Coelogyne cristata orchids require a lot of light, but not direct sunlight. They should be kept cooler than room temperature, between 16 and 18 °C (60.8 - 64.4 °F) during the day and 12 °C (53.6 °F) at night. In the summer, it is permissible to leave them outdoors in partial shade. But, if the temperature is too high, they will not bloom. During the growing season, they should have plenty of water because they require high humidity. Shower them with lime - and sodium poor - water. After the orchids bloom, gradually reduce the watering until November, when the resting period begins. Stop it when the resting period begins. Coelogyne cristata should not have any more liquid nourishment. Because it is an epiphyte, it can be managed with very little nutrition.After the resting period, when Coelogyne cristata starts to grow again in the spring, it can be replanted in porous and fibrous material, such as pine bark, charcoal pieces and even a little sphagnum, which are all known to be favorable to the orchids. But it should not be planted until the pot is filled with roots. Propagation is by division. Price is for one blooming size division similar to last photo.